In the last days I received multiple requests to translate my posts for foreign readers, as they have very limited information about the happenings in Ukraine. I've been monitoring situation in Kiev for several days, and here's the chronicle of todays events, translated to English. Russian version is here. Sharing and distribution is appreciated. thanks to Dmitry for translation. - It is difficult to get into Kiev and move around. Underground railway is not operational, because of the pretext possible terrorist attack, entrances to the city are blocked too. Some reports about main roads being blocked by trucks with sand. Last night all cars, which went to the Maidan were searched. Airports are still working. 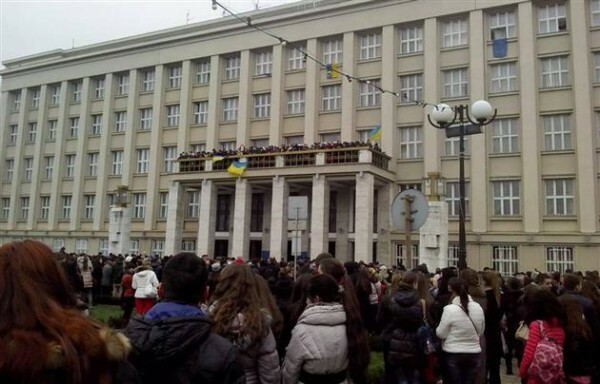 - Information from other regions: At Lviv, Ivano-Frankivsk and Ternopil protesting mob seized the regional administration building, then MIA field offices and prosecutors, which were defeated. In Ternopil there was also captured armoury. 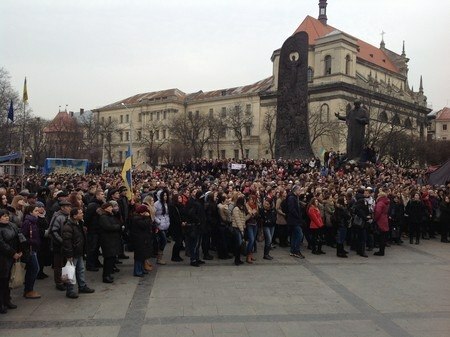 In Lviv, the police refused to fight with the opposition and lay down their arms. - Officialy confirmed: 25 people were killed (16 - civil, 9 - law enforcement). injured - 350, 241 - hospitalized. Unofficial evidence are very different and difficult to calculate. 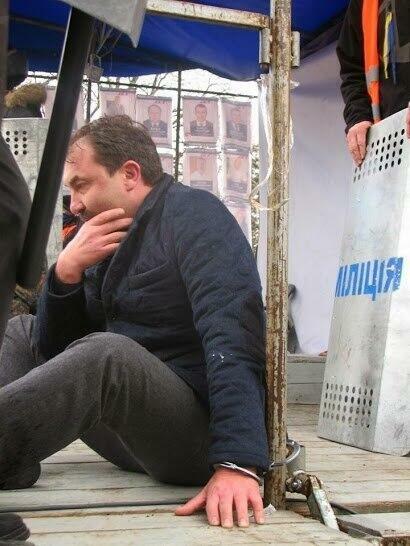 - 28 journalists were injured. Here is a complete list. - Statement by Klitschko: "Yanukovych has inadequate reaction to the situation. Everything he said - is that the opposition leaders have urged people to stop the confrontation on the Maidan and lay down their weapons. I believe that the government should immediately withdraw security forces and stop the bloody opposition, because people are dying. And I said this to Yanukovych. While bloodshed, which negotiated could be? Unfortunately, he doesn't have understanding of the situation". - Yanukovych's silence has run out, he appealed to the people where he is blaming the opposition. But he does not want to use force, and wants to talk. 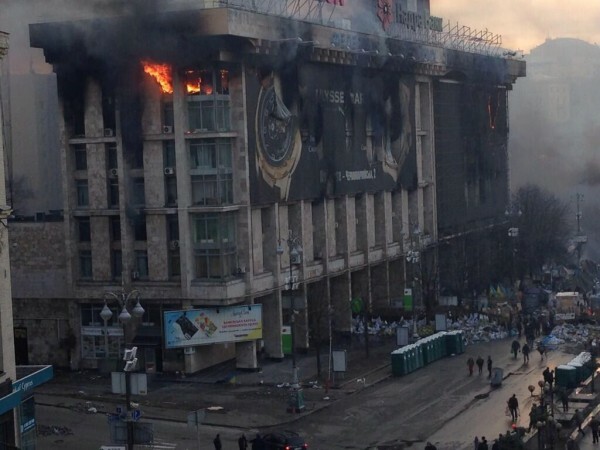 10:19 (8:19) At the Maydan, home of Unions is still on fire, there was headquarters of the Maidan units. The building has collapsed overlap between floors. All rescuers had to leave the building. 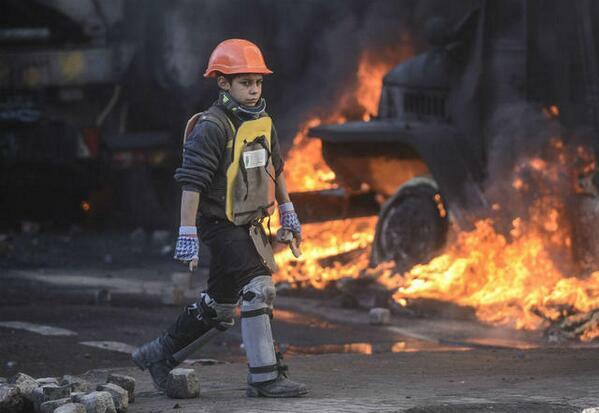 10:22 (8:22) Today, in the center of Kiev all schools and kindergartens will be closed. 10:33 (8:33) Almost all night watching the live broadcast, and have a feeling that the security forces stopped at least 30 meters from the scene awaiting for the orders. 10:40 (8:40) Security forces are trying to surround the Maidan and use new ways, on the other hand Maidan strengthened with new barricades. 10:44 (8:44) The General Secretary of the United Nations Ban Ki-moon called to the authorities and the opposition in Ukraine with a propose to show restraint and avoid further violence. 10:49 (8:49) In a burning house of Unions ceilings has collapsed. Previously 40 people have been rescued. 10:53 (8:53) Journalist from "5 channel" Inna Nerodik: "Train Ivano-Frankivsk - Kiev stopped halfway, removed from the main rails, waiting for 1,5 hour, not explaining anything, checking documents." 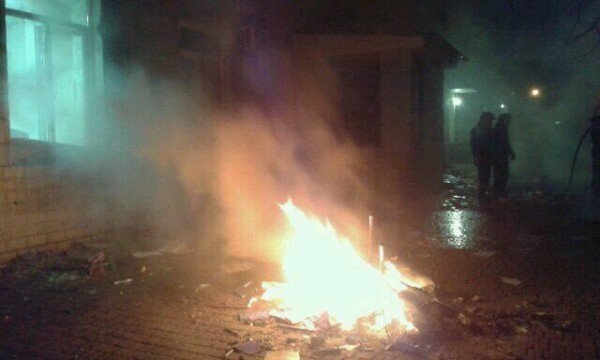 10:55 (8:55) Kharkov "Freedom" opposition office was set on fire, same happened to "UDAR" party office in Krivoy Rog. 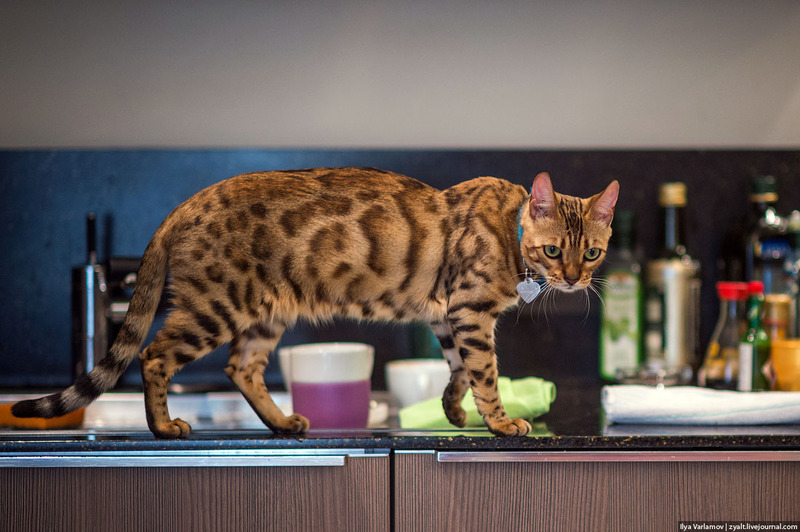 "They tried to open the window grille. But They did not succeed. 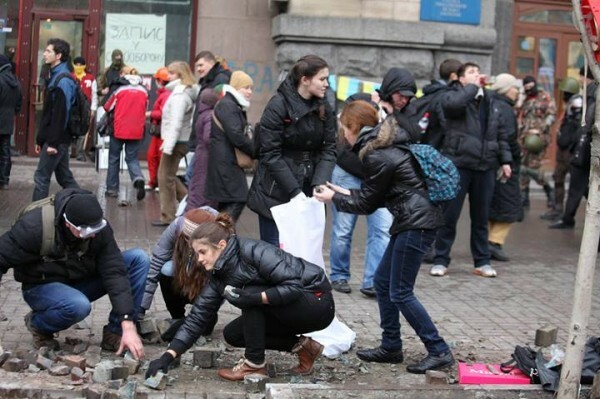 Then, breaking a window, they threw a Molotov cocktail inside," - said the head of the executive committee of the party Viktor Shcherbina. 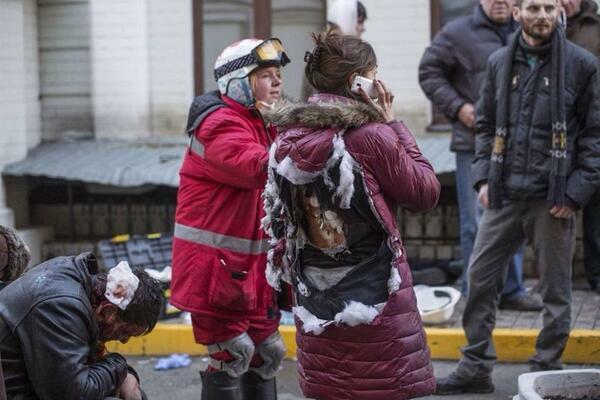 10:56 (8:56) Hospitals of Kiev asked to donate blood for the wounded. 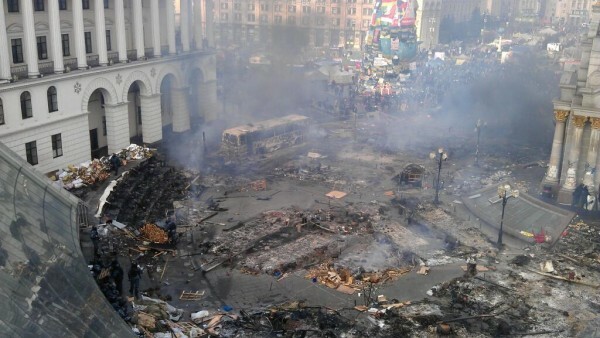 10:57 (8:57) Ukrainian Interior Ministry blamed the House of Trade Unions "Right Sector" in the fire on. They believe, that they set fire to hide the presence of explosives in the building. 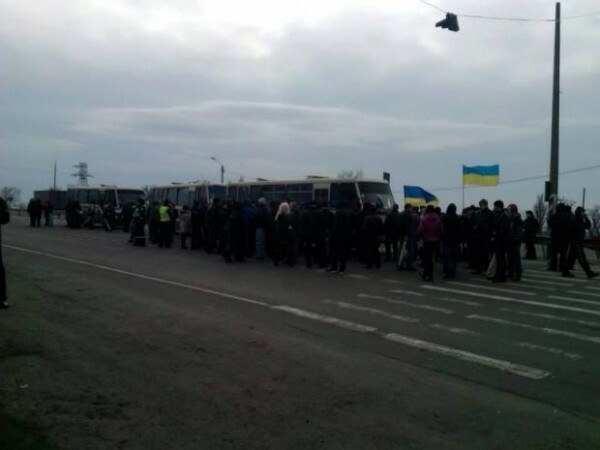 11:20 (9:20) Security forces blocked the route Zhitomir- Kiev and Odessa-Kiev. 11:33 (9:33) Dalia Grybauskaite (President of Lithuania): "The international community should take all possible measures to help Ukraine and stop escalation of the conflict, as well as to find a peaceful solution." 11:42 (9:42) Train Ivano-Frankivsk, Kiev had stopped because of info about the explosive device. 11:52 (9:52) UEFA has not found grounds for cancellation Europe League match in Kiev. 11:54 (9:54) 40 people were blocked on the road at the crossing point "Krakovets" on the border with Poland, throwing the road by tires and other objects. The area becomes a traffic jam of several dozen trucks. 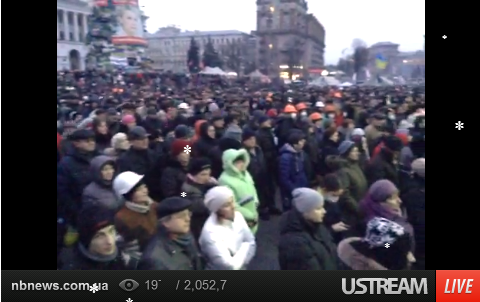 12:00 (10:00) Espreso.TV broadcasts from the stage of the Maidan, they are calling to substitute young men, standing on the barricades for all night. They got too less forces, but they need to prepare new barricades with necessary, because nobody knows, what will happen in the near future. 12:00 (10:00) Arriving to the Kiev's hydroelectric station. 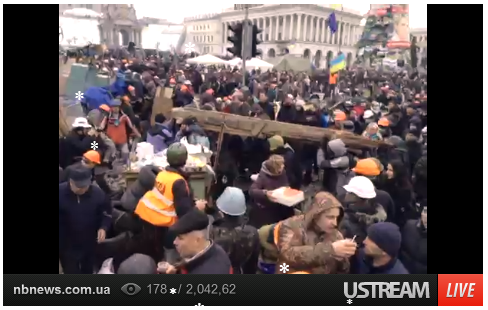 12:19 (10:19) New people started coming at Maidan with food and tires. 12:33 (10:33) A route from the Borispol airport to Kiev is closed. All unfold. 12:53 (10:53) Public transport is translated into enhanced mode. Kiev subway is still closed because of the threat of terrorist attacks. 12:57 (10:57) Facebook page of Evromaydan SOS published a list of detained activists. 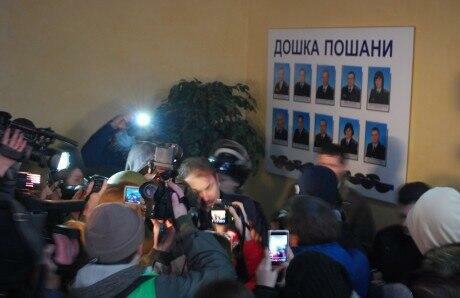 According to their information at 5.00 on February 19 is more than 50 people in the police. 13:12 (11:12) In the violence and killing must blame President Yanukovych, whose had "blood on their hands," tweeted Sweedish Foreign Minister Carl Bildt. 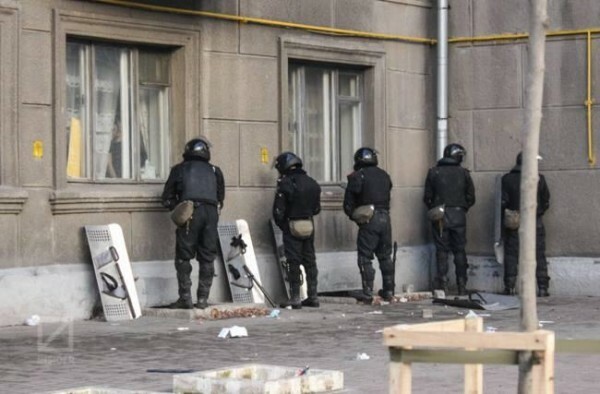 13:15 (11:15) The Canadian Embassy in Kiev closed after the defeat - formerly Deputy Chief of Investigation Department of the Ministry of Internal Affairs of Ukraine Oleg Tatars reported, that "Group of unidentified armed men with sticks broke into the Canadian Embassy, where began to destroy property." According to him, the attackers attempted to inflict bodily harm to the staff of the embassy. Earlier, the press secretary of the Canadian Foreign Minister Adam Hodge said that the Government of Canada has no claims to a group of demonstrators - " who had taken refuge in the Canadian embassy in Kiev." He noted that "The safety of the Canadian Embassy is not in danger ," Those people who had taken refuge in the building protestors behave peacefully , did not cause any damage to the property and no harm to employees "
13:26 (11:26) Head of Ukraine Olympic Committee, the famous athlete Sergey Bubka said he was willing to do everything possible to stop the violence in Kiev. Multiple world champion admitted that he was shocked by what is happening in his country. 13:29 (11:29) Kiev police opened criminal proceedings in connection with the murder of the journalist from newspaper "Vesti" Vyacheslav Veremei. 13:48 (11:48) Peskov: "I do not know whether Putin ignored the call from Yanukovych. Kremlin's position - not to interfere"
13:57 (11:57) The Security Service of Ukraine has begun the pre-trial investigation into the attempt to take power by "certain politicians". 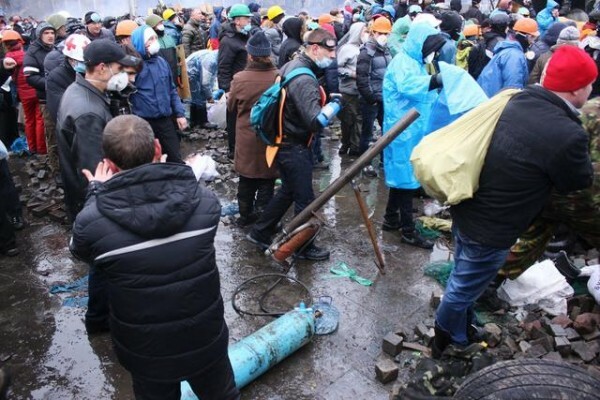 14:04 (12:04) Law enforcement agencies began an offensive on the Maidan, the police began to use water cannons and try to push people. 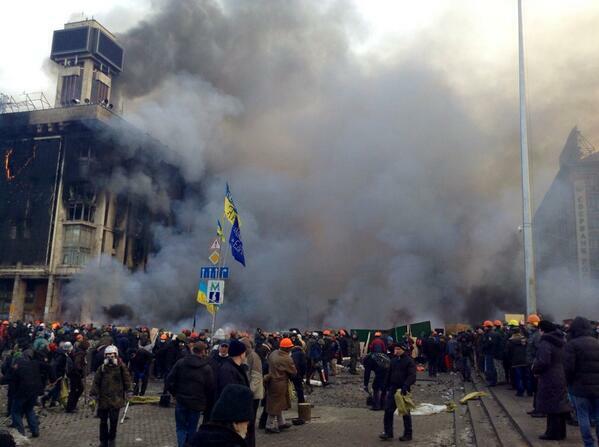 14:05 (12:05) in Kiev, the number of killed policemen has increased to 10 people. 14:31 (12:31) European Commission President Jose Manuel Barroso: Events of last 24 hours in Ukraine, were shocking and its a complete disappointment. There are no circumstances which may justify or legitimize such scenes. We express our deepest condolences to the victims and their families. We strongly condemn the use of violence as a way of solving this political and institutional crisis. Responsibility for providing protection of fundamental rights and freedoms lies on the political leadership of the country. 14:45 (12:45) U.S. Vice President Joe Biden said that the Ukrainian government "has a special responsibility for the settlement of the situation" in the country. In this case he personally told to the president of Ukraine Viktor Yanukovych in a telephone conversation, TV channel CNN. 14:56 (12:56) Stolen weapons from the district police departments in Lviv , according to ZIK. 15:07 (13:07) The commander of the Interior Troops of Ukraine Stanislav Shuljak said, that five soldiers killed Feb. 18, were shot with a sniper rifle. 15:33 (13:33) Minister of Interior Zakharchenko said, that the responsibility for the killed and wounded at Independence square - on opposition politicians. 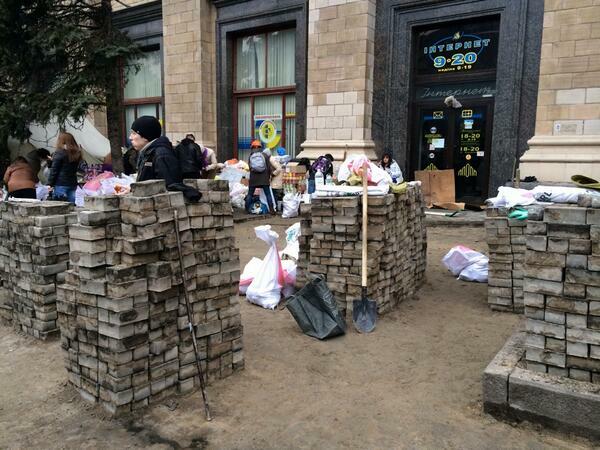 15:40 (13:40) "Ukrainskaya Pravda" writes, that troops build reinforced concrete barricade on Grushevskoho street. 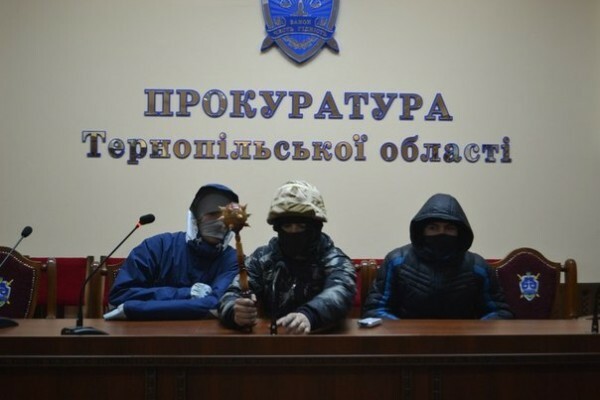 15.50 (13.50) Got info, that Rivne city base of Berkut is captured by protesters. 15.59 (13.59) Unconfirmed: Minister of Internal Affairs of Ukraine Vitaliy Zakharchenko wrote in his resignation on Wednesday, February 19. 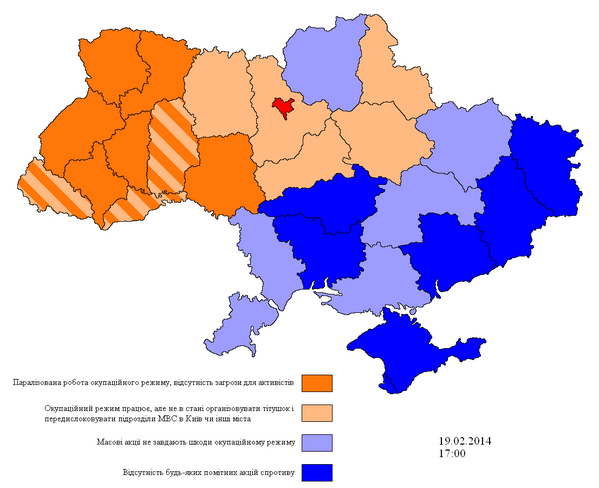 This info was reported by Ukrainian online edition "Obozrevatel". 16.10 (14.10) Russia now thought about money and future risks (finaly good decision) Its now under the question providing to Ukraine the second tranche of the loan. 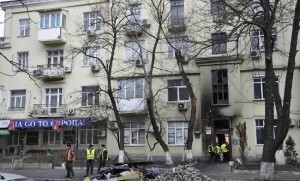 In Kharkov Nationalists party office is burned. 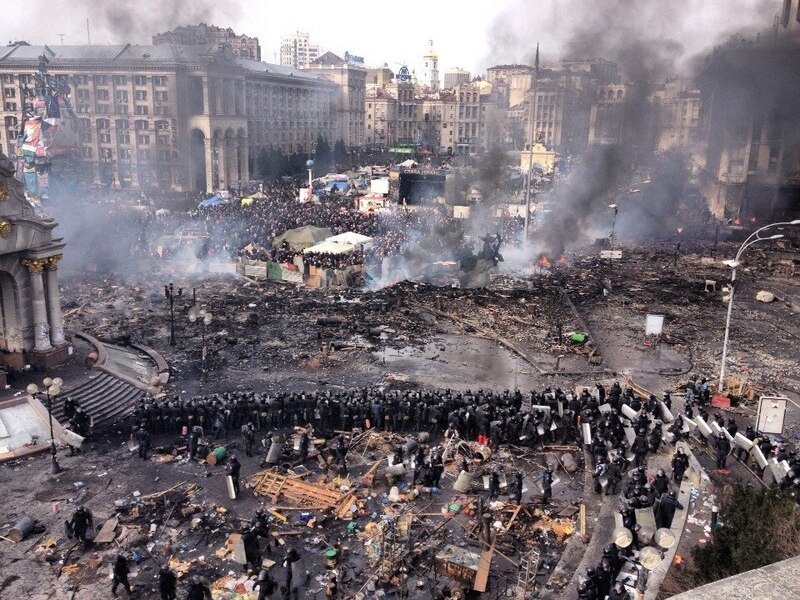 "With an alarming heart watching the fact that these days takes place in Kiev. 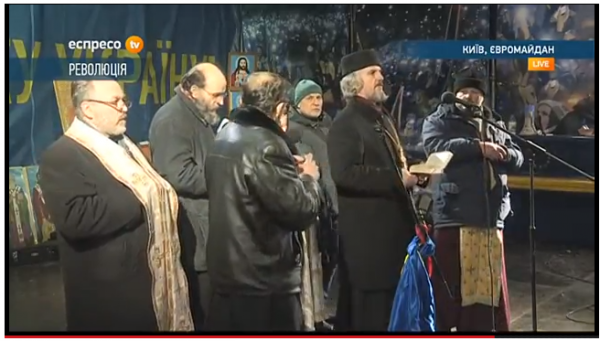 Assure the Ukrainian people in their spiritual closeness and praying for the victims of violence, for their families and for the wounded "
16.40 (14.40) just knew, that security officials got to resign! This is about if how the FSB would say "sorry, guys." 16.41 (14.41) Europe want to impose sanctions against Ukraine already for February 21. 16.42 (14.42) At the people ask, in which way can they help, offer food and medicines. 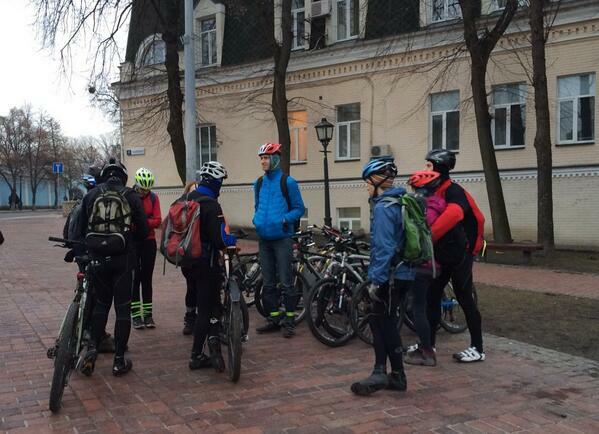 16.43 (14.43) Information about the police of Lutsk, who have sided with the protesters is confirmed. 17.10 (15.10) The European Parliament issued a press release: The bloodshed must be stopped at all costs. 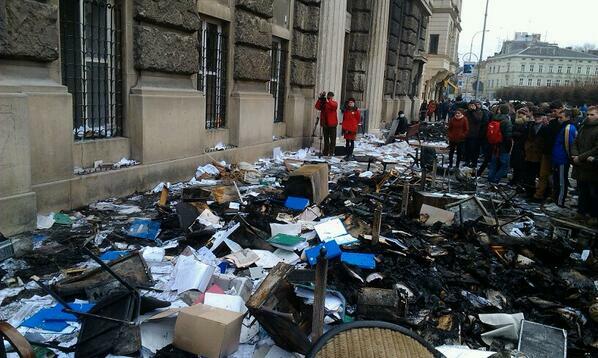 17.13 (15.13) Protesters occupied the building of Radio and Television in Kiev. Peoples tryed move chairman fall on kneels. 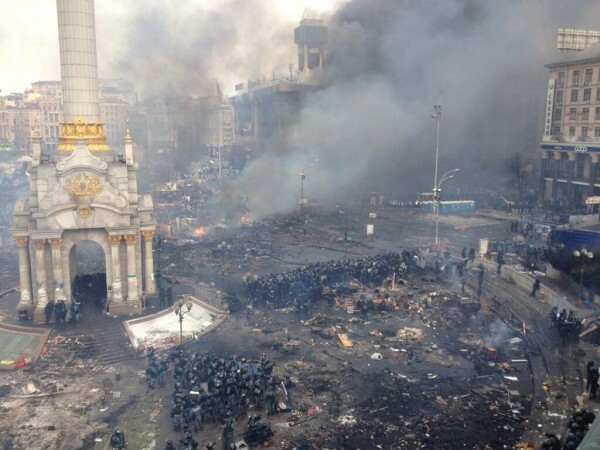 17.20 (15.20) Its said, that in Kiev begins to disappear Internet and mobile communication. 17.25 (15.25) Protesters stormed the building of the National Council of Ukraine, and medicines for pharmacies can not pass to Kiev. its stopped at Control Points. 17.32 (15.32) In Kiev, problems having started with food. 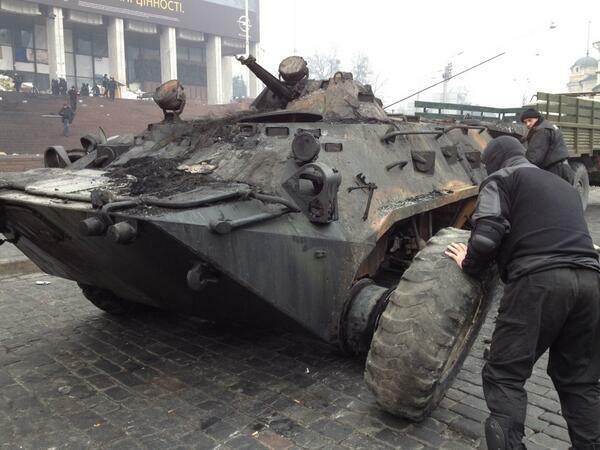 Self-defense forces of Lutsk city rides on the Maidan. 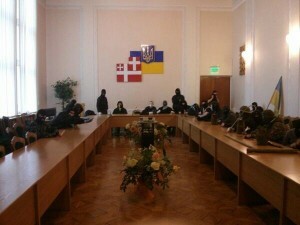 17.35 (15.35) Chernivtsi region Governor Michael Papiev wrote in his resignation to the President, after collecting opposition signatures, that there will not be riots and bloodshed in this case. 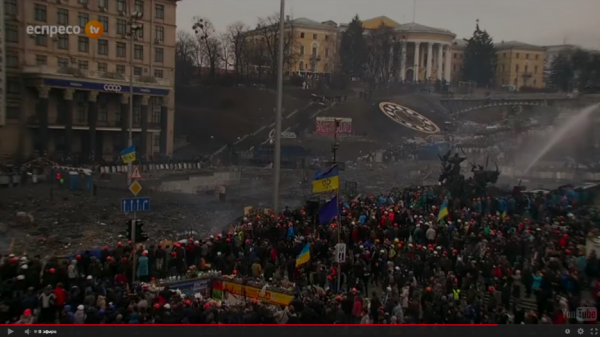 17.53 (15.53) In next 7 minutes, people write, will start the assault of Maidan. 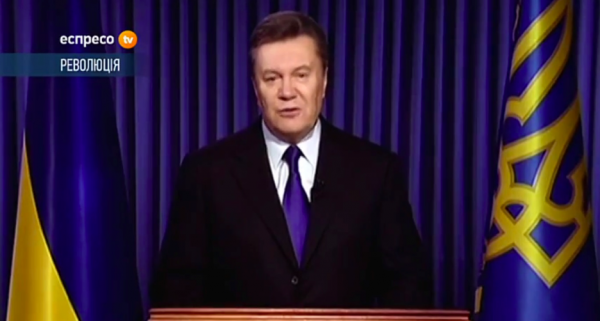 18.02 (16.02) Yanukovich says that he is legitimately elected president. And as the guarantor of the Constitution, it shall ensure the rule of law. Calls on the leaders of the opposition to stop conflict and says, that there will be kinda elections - and people will decide everything. 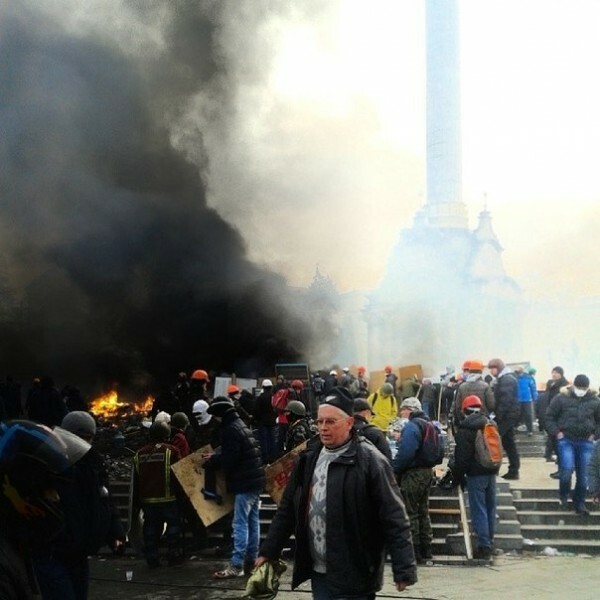 18.05 (16.05) Storm of Maidan has began, it seems. The first tank came to and was immediately set on fire. 18.28 (16.28) Storm of the square has not begun. 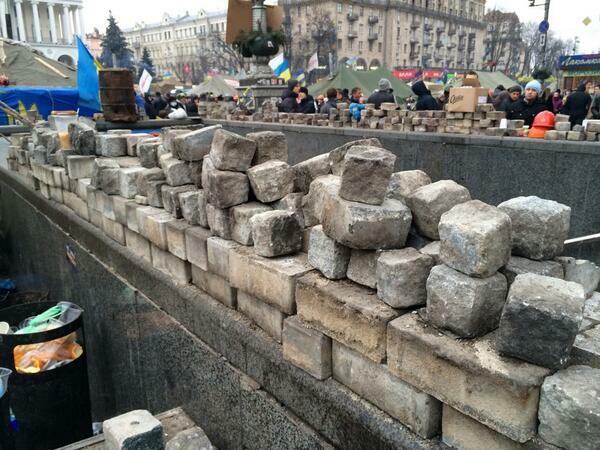 Maidan still in the place. Security Service of Ukraine threatens of massive antiterrorist operation across the country. 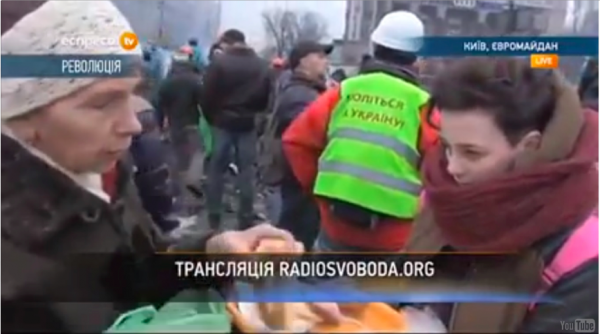 18.34 (16.34) Women brought food to the square, in the best traditions of Maidan society culture. 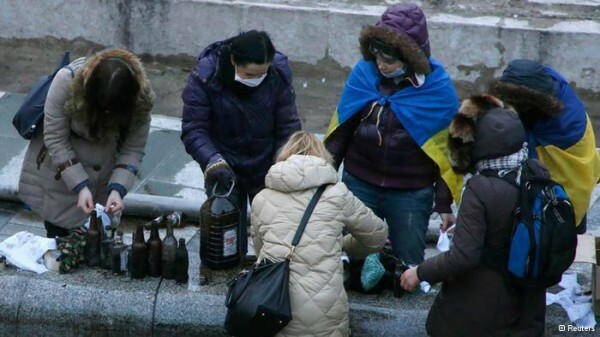 18.38 (16.38) Evromaydan activists built an air gun for shooting at law enforcement officers. 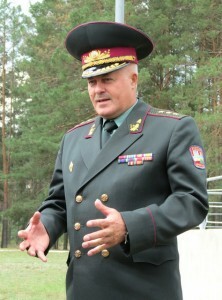 18.41 (16.41) Photos of chained governor from Volyn region. 18.55 (16.55) Photos from the place. Washington annulled visas to several officials of Ukraine. Klitschko appealed to Ukrainians: Power of Yanukovych should go. 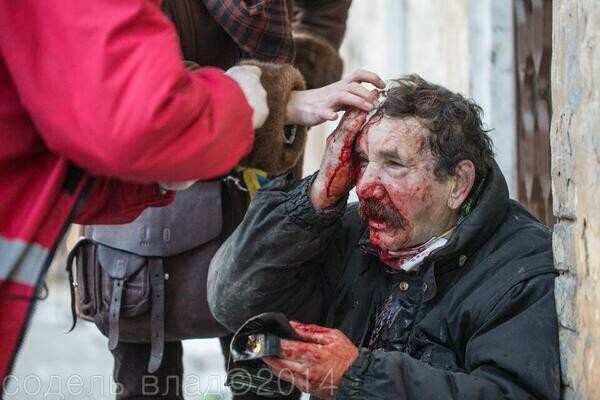 Cause for only Yanukovych is responsible for the murder and terror against civilians. 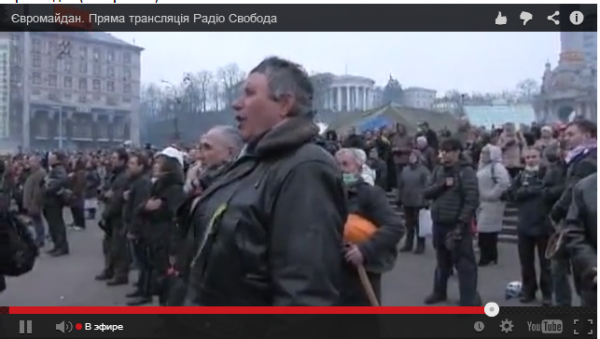 Ternopil BERKUT forces down their arms and go to Maidan. "There is not a lot of police at Instytutska street. 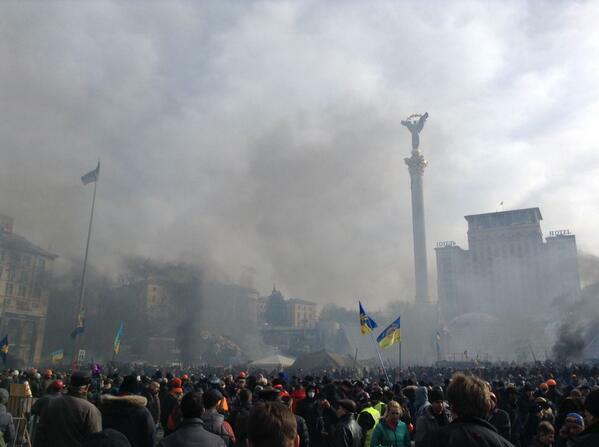 Their function is like at simply not to give Maidan expand. Plenty of plainclothes officers. At one of the photos you may see how works the forensic expert. Also drove another water cannon. House of Unions is on fire. Molotov cocktails thrown by both sides. Policemen noticeably tired. 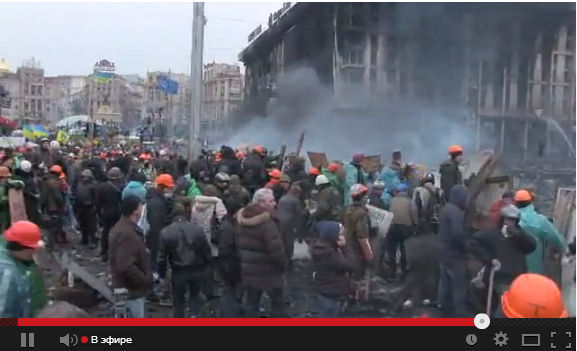 Gunfire and explosions continue "
19.43 (17.43) Protesters took the main post office building. They say they only occupy the lobby. 19.57 (17.57) Activists blocked three buses with "titushki" near Lubny city. 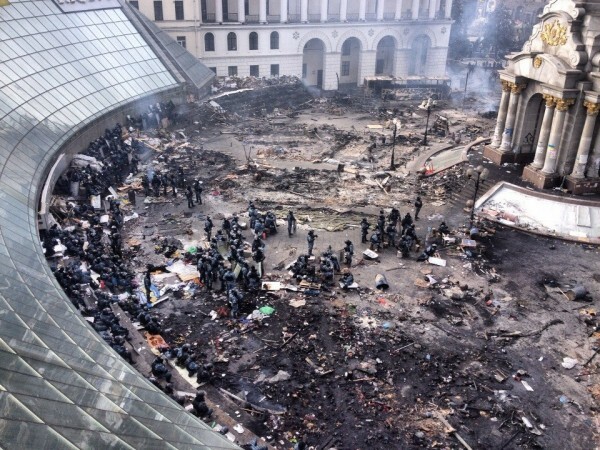 20.00 (18.00) At 19.00 there will be a meeting for information on the Maidan. 20.16 (18.16) Priests pray on stage. 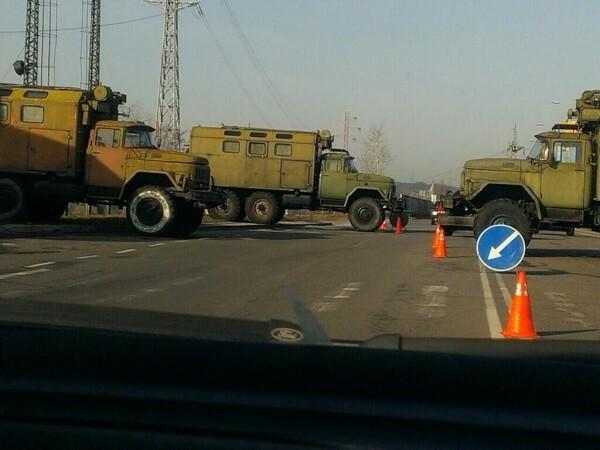 20.56 (18.56) Troops from Dnipropetrovsk are landing at the base of MOD in Vasilkov. 20:58 (18:58) EU Member Countries reached a preliminary agreement to impose sanctions against those who responsible for the escalation of violence in the Ukraine. 20:59 (18:59) Girls are disassembling the road. 21:34 (19:34) Reports say that 100 people went missing. 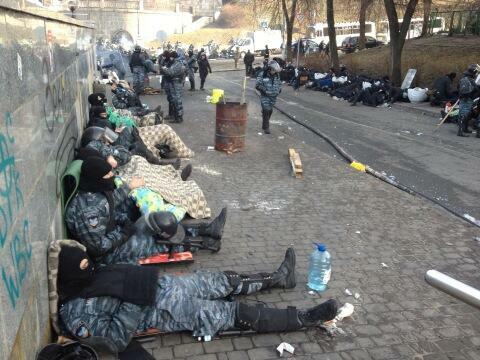 21:35 (19:35) Police stormed the Maidan. Encourages people to leave the area and pours all of the water jet. 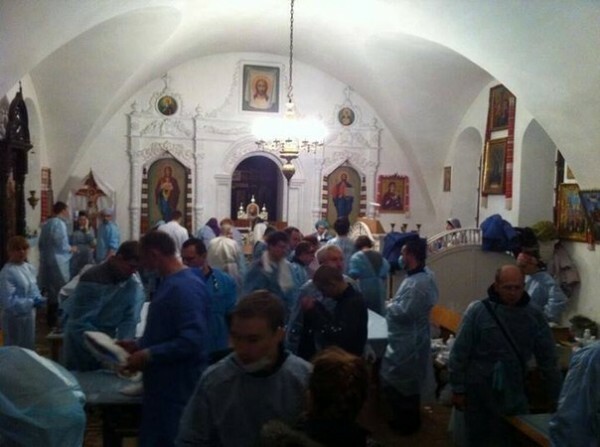 21:37 (19:37) Kiev hospitals are overflowing with severely injured. 21:41 (19:41) Security forces massively sent in Kiev from Kharkov: 12 buses have already left. 21:49 (19:49) The office of the Party of Regions burnt down in Poltava. 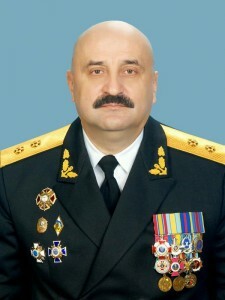 21:57 (19:57) Chief of the General Staff of the Armed Forces of Ukraine was fired by the President. 22:07 (20:07) The building of regional parliament is being assaulted in Jitomir. 22:11 (20:11) Kiev: Kindergardens and schools are closed till 21th of February. 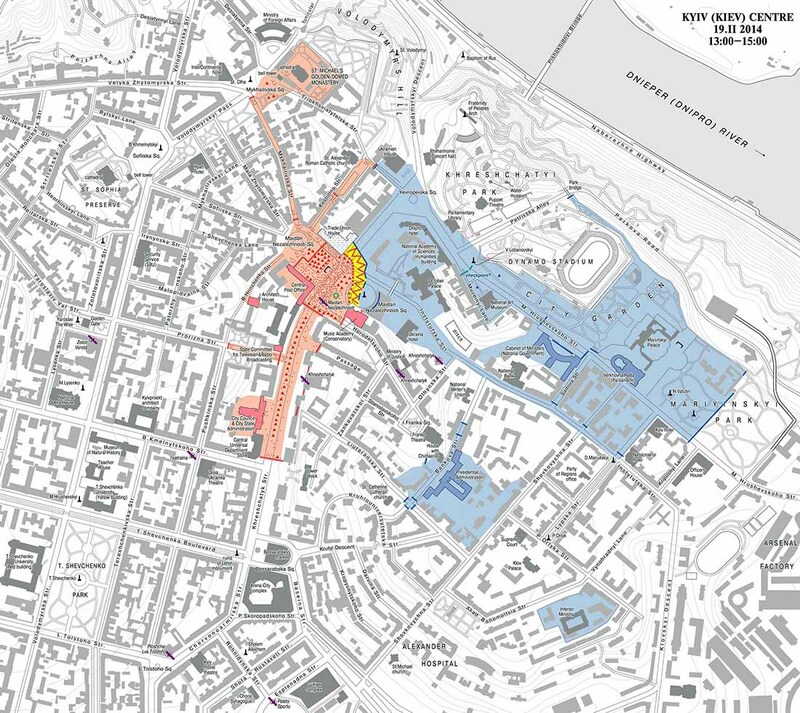 А то что это такое "The city itself does not work underground"? Тут написано "Сам город не работает под землей"
у меня тоже глаза на этом сломались, там ещё много жира. Find yourself a better translator... Quite poor English indeed. "Europe want to impose sanctions..."
"Stolen weapons from the district police departments in Lviv..."
I guess: "Stolen weapons from the district police departments ARE in Lviv..."
Or: "Stolen weapons from the Lviv's district police departments..."
P.S. Твой переводчик, Варламов тупа делает "кальку" с Русского языка, не владея толком "инглишем". Для человека, знающего англ., это выглядит смешно. Более того - некоторые моменты непонятны и обманчивы информационно, как я показал на втором примере. Большое спасибо Google-переводчику за оперативный перевод! И по украинским сайтам тоже с Google-транслейтом удобно лазить. Он в ссылки со страницы автоматом перевод вставляет. Тесак тебе в помощь, нацык ёпть. Снизу поста, но там нужно несколько секунд ждать пока подгрузятся и появятся. А в прошлом посте были рядом со строкой "20.56"
Пора наводить порядок. Не ждать ,а решительно действовать. что это ты на бусурманский перешёл?